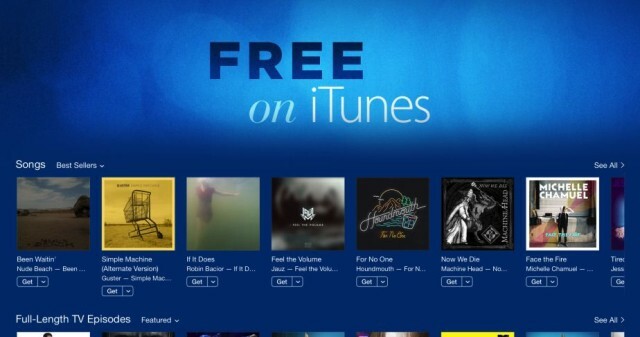 Put away your wallet, Apple’s got a new ‘Free on iTunes’ section. Ever since Apple made the tactical error of giving everyone a free U2 album (#firstworldproblems), the company has been a tad on the, well, miserly side — with no Mac, iPad or iPhone discounts on Black Friday, and even the company’s customary 12 Days of Christmas giveaway canceled. Bah, humbug! Clearly someone in Cupertino (head of retail Angela Ahrendts?) has woken up in a newly charitable mood, however, because Apple has just updated its iTunes Store app for both iOS and desktop with a new “Free on iTunes” curated section, which helps customers find content they can download without having to rack up any extra post-Christmas credit card bills. The section currently includes songs by artists including Asking Alexandria, Machine Head, Rogue Wave, and episodes from TV shows such as 12 Monkeys, Backstrom, KC Undercover, and more. As you may have got from reading that list, Apple’s not giving away its best-known material for free, but rather using the section to highlight some lesser-known gems, which may then encourage users to shell out for other premium content. Sadly, Apple’s generosity only goes so far — and you won’t be able to access the “Free on iTunes” section if you don’t live in the U.S. With that said, if it proves to be a success, there’s no reason Apple wouldn’t bring it to other countries given a bit of time. Welcome back generosity; we missed you! This entry was posted in Apple news and tagged Free on iTunes, itunes. Bookmark the permalink. Even Steve Jobs would approve if the iPad Pro’s stylus looks like this.